Provided by kind permission from Cruising Guide Publications. When you arrive for a yacht rental for bareboat charter with Virgin Motor Yachts our Operations Manager will complete a comprehensive ‘boat briefing’ covering all systems of your charter yacht or power catamaran. He will also walk through a full ‘chart briefing’ with you on the first day of your charter. 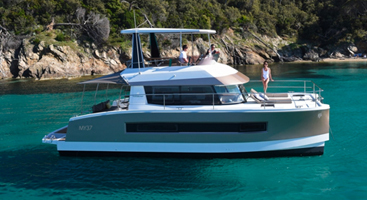 This briefing on your yacht or power catamaran will ensure you feel comfortable with the boat before leaving Nanny Cay to begin your charter. Our Operations Manager will also review multiple maps and charts of the British Virgin Islands, Virgin Islands and the anchorages on Tortola, Norman, Jost Van Dyke etc. with you. This briefing will describe where you can safely moor your yacht during the day and overnight. 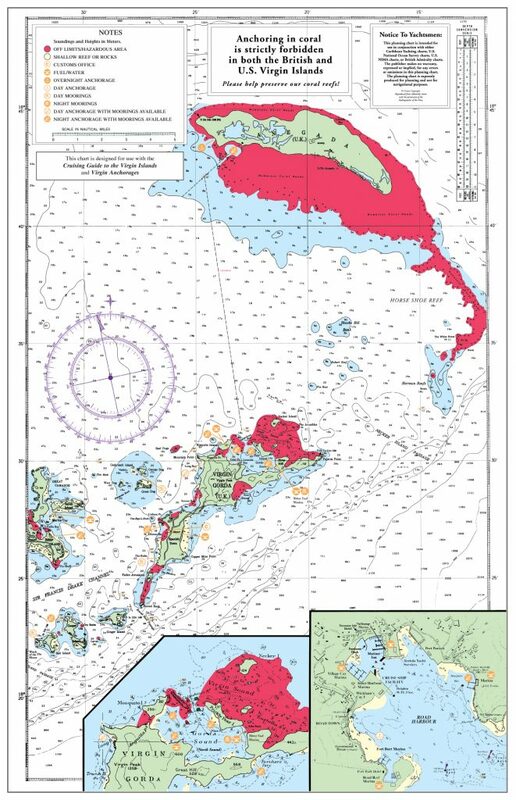 The BVI maps below show the areas that are allowed and/or restricted for bareboat charter guests. We recommend that all of our charter guests download them and spend time reviewing them prior to their trip. Please note, these are not ‘navigation charts’, they are for guidance and information purposes only. A detailed British Virgin Islands navigational map will be provided to you at the start of your yacht charter. This navigational chart will be your primary reference for hazards, however it also has more detailed areas for anchoring, mooring, and more. 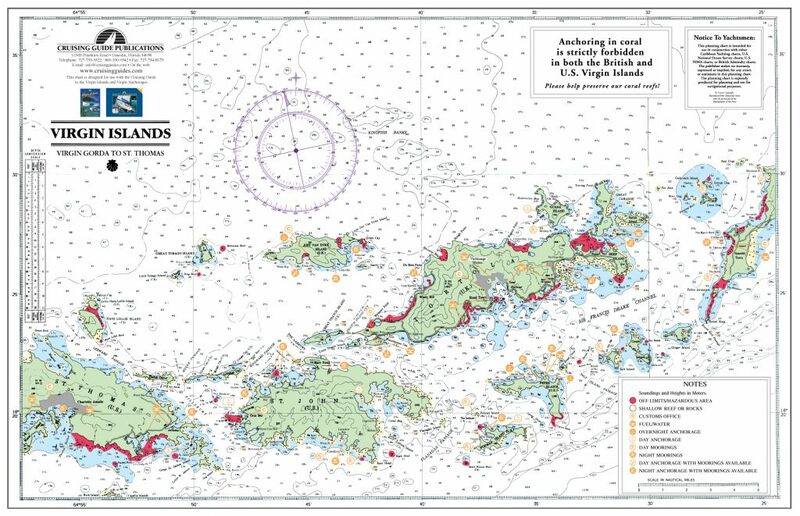 The British Virgin Islands map and hazard chart is a great reference for planning your BVI itinerary on your yacht charter. 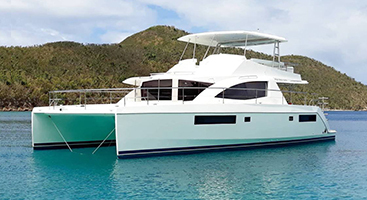 It allows guests on a boat charter and/or power catamaran to see the safe anchorages with mooring balls where you can stay comfortably with your yacht overnight. One area that is not noted as ‘red’ or ‘out of bounds’ on the chart is White Bay, Jost Van Dyke, home to the Soggy Dollar Bar. Recently, many of the mooring balls have been removed from White Bay to allow for safer swimming to shore. This means there are far fewer mooring balls and more guests and day boats anchoring in an unsafe manner. Because of this, we at Virgin Motor Yachts have decided to make White Bay ‘out of bounds’ for our charter guests. We no longer feel it is safe for our guests or yachts to moor or anchor in White Bay. Instead, we ask guests to pick up a mooring ball in Great Harbor, Jost Van Dyke and then either dinghy or a taxi to White Bay and the Soggy Dollar Bar. Most of our charter guests will not need to refuel their yacht until the end of their charter but certainly may need fresh water for the boat and gas for the dinghy. You will find all of the locations for these resources clearly marked on our interactive map of the BVI. How much fuel will I need for a week? 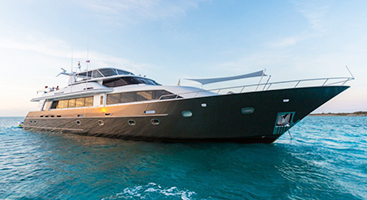 If you are new to chartering in the BVI, I am sure you are curious how much fuel you will use in a week. 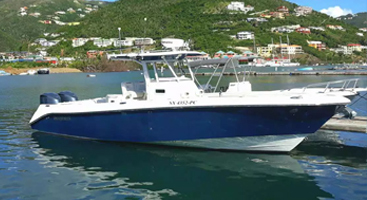 It varies quite a lot depending on a) Which boat you are chartering b) How much distance you cover and c) How much you run your generator, but on average our guests use around 190 gallons/week. How much is fuel, gas, and water? Prices may vary throughout the islands. For further information speak to our Customer Service Assistant when you arrive for your charter.